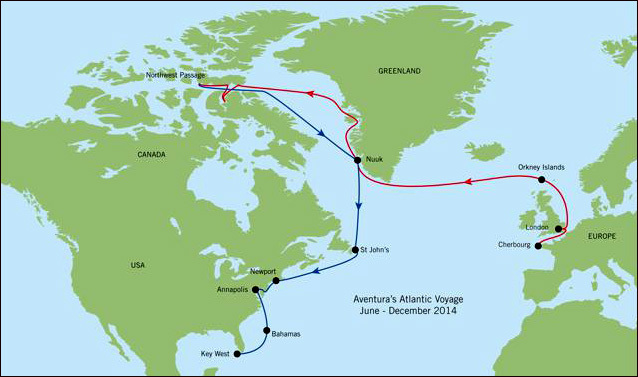 Home > Aventuras Log > A New Attempt on the Northwest Passage? After the decision was taken to abandon the passage to Tahiti, rather than transit the Panama Canal again, and sail back to Europe across the Atlantic, a very different alternative came into focus: return to Europe by a more challenging route by making a new attempt on the Northwest Passage this year. However, once I had made that decision, I realized that time was too short to catch the best time for a west to east transit. The logical solution would be to ship Aventura north on the next Seven Stars transport to Victoria, BC. 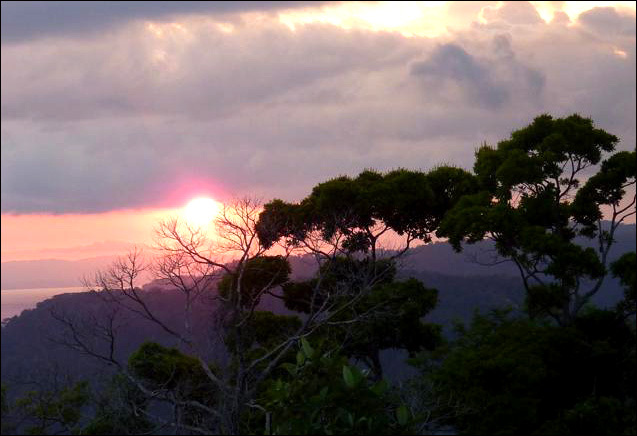 We immediately changed course for Golfito, in Costa Rica, to meet the northound transport. 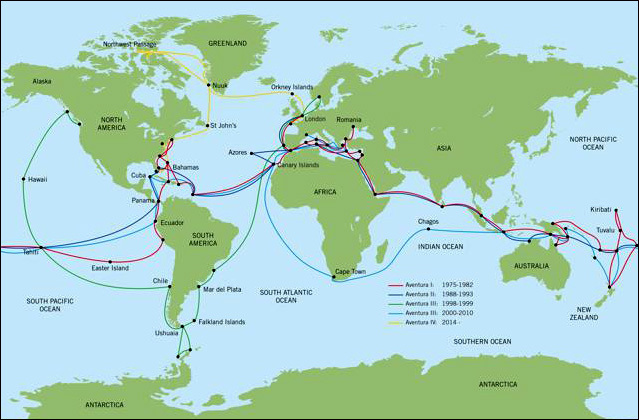 There is a certain symmetry in opting for this solution as in 1999, having sailed with Ivan from Antarctica to Alaska (see the chapter Antarctica to Alaska: A Transpacific Marathon from my book A Passion for the Sea), at the end of that long voyage Aventura III was shipped back to Europe. We both had commitments to attend to back home and had decided to postpone a subsequent westbound crossing of the Pacific. Two years later I set off again, passed through Panama Canal, rounded the Cape of Good Hope and completed my third circumnavigation of the globe. 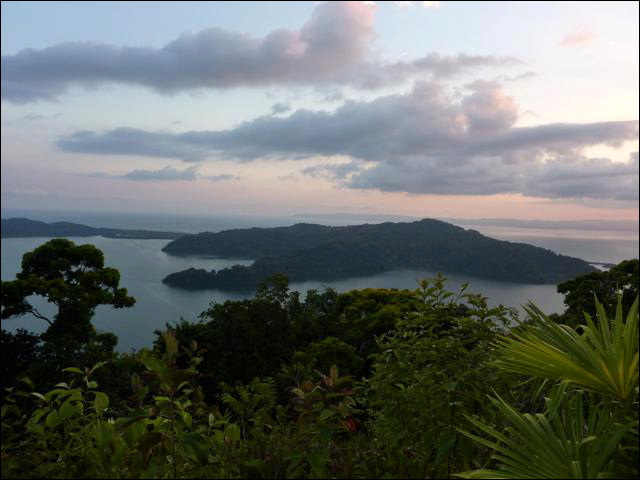 For many years the perfectly sheltered harbour of Golfito has been a popular destination for US and Canadian boats sailing to or from Panama and the Caribbean, or just cruising the Central American coast. 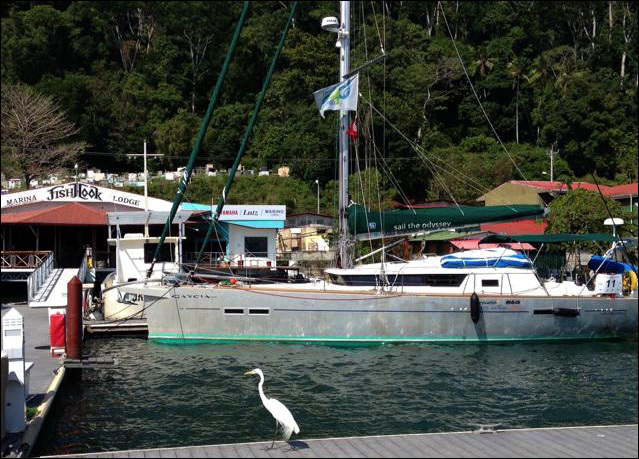 As we sailed into the landlocked harbour, I was surprised to see only about half a dozen sailing boats, and a few more motor yachts anchored or docked at the two marinas, Banana Bay and Fish Hook. This may not have been the high season, but the moment I stepped ashore I felt that there was more to it than just a slow but steady decline. The reason became clear when I was quoted more than twice the cost of the docking fees I had paid recently at Shelter Bay in Panama and Key West in Florida. Cruising sailors on a tight budget have obviously voted with their feet. Golfito’s main attraction is its proximity to large tracts of virgin rainforest, home to a large variety of wildlife, sloths, various species of monkey (howler, spider, white-headed capuchin) and all kinds of birds, from minuscule hummingbirds to majestic toucans. Keen to stretch our legs, Dunbar and I set off along a steep forest road marching steadily upwards in the sweltering heat. Having been erroneously advised about the distance to walk to the nearest wildlife spot, it took us twice as long as expected to finally reach the summit of the ridge. Huge trees shot into the sky, their rich canopies brushing the clouds. 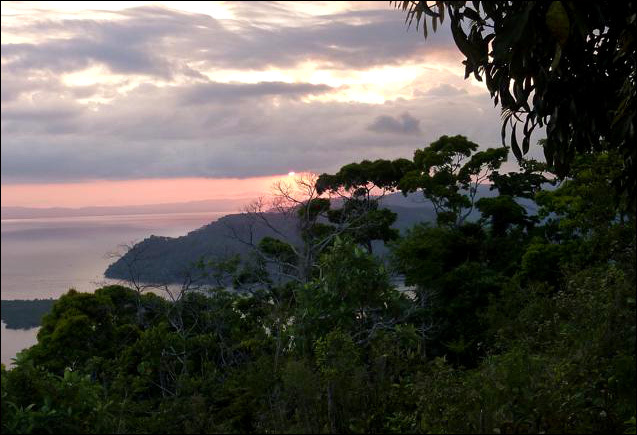 The sun was almost setting as we crossed a small meadow that overlooked Golfo Dulce. We were rewarded for our efforts by a spectacular sunset as the flaming orb broke through the clouds to bathe the waves of densely clad ridges in a misty purple light. With Dunbar generously agreeing to stay behind to load Aventura onto the Seven Stars ship that will take her to Victoria, BC, I was able to book an early flight home. 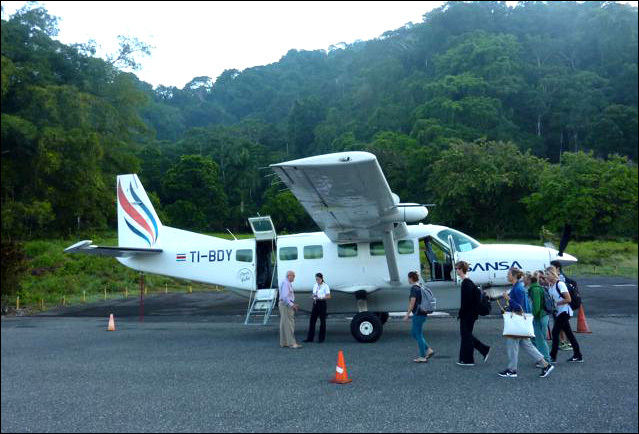 The small 12-seater plane took off flying over Golfo Dulce, then, as it gained height, it opened a vista of massive rainforests. 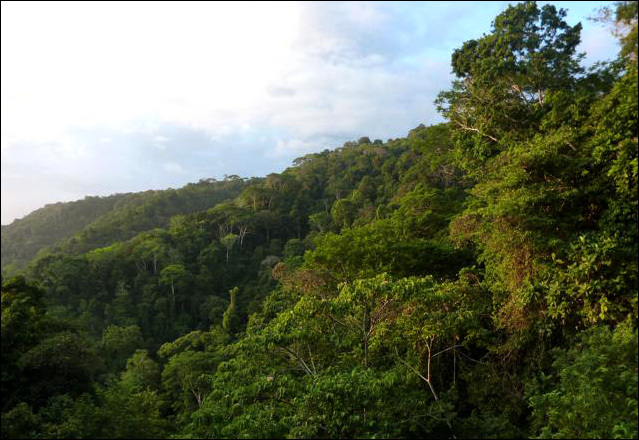 Gradually the forests gave way to scrub, then to scarred and eroded hillsides where the virgin forests had been cut down to be replaced by palm oil plantations. Our co-pilot was an attractive young lady, confidently assisting the grizzled captain. My thoughts drifted to the recent Germanwings disaster and wondered why the flight deck is almost exclusively the domain of male crews. 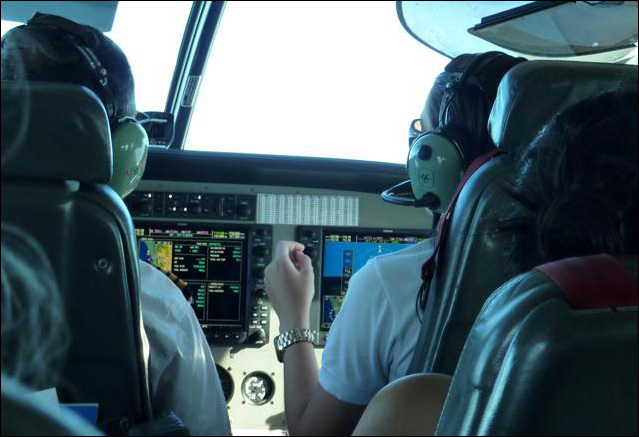 In my many years of flying I have maybe flown with two or three female captains and four or five co-pilots. I am sure that many passengers would feel more comfortable hearing a female voice from the cockpit. Such a discrepancy is quite unacceptable, and there is absolutely no reason why women shouldn’t be as good pilots as men. Airlines should be obliged to apply positive discrimination so as to get closer to parity between sexes… as they seem to be already doing in Costa Rica.